I was planning on posting to my blog on a monthly basis, but before I knew it the summer flew by. Between attending weddings, prepping for teaching the fall semester at MacEwan, and working on a few Make Something Edmonton projects I’ve been involved with, it’s proven to be a little difficult to sit down and write. However, one project that I was recently involved with has compelled me to take a moment and try to make sense of some of the thoughts that have been buzzing around in my head. Over the past month, I worked together with a group of dedicated Edmontonians to put on a pop-up bike lane rally that took place on September 20th. Earlier this summer, I saw a call to join a working group that focused on the 102 ave bike lane. The group, headed by the amazing former city councilor and community activist Michael Phair, was concerned that there was a possibility the city would not fund the proposed 102 ave bike lane. And so we brainstormed ideas that could generate public awareness on the issue. 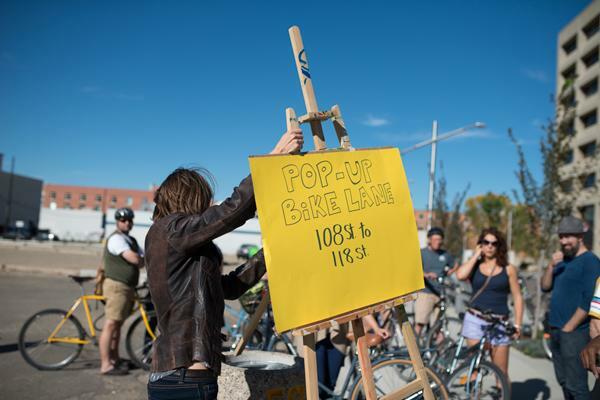 On August 13th we decided to look into the possibility of staging a pop up bike lane rally. Barely a month later we were able to bring that idea to fruition. If anyone is looking for a living example of the Make Something Edmonton spirit, you can look to this event. The support we received from the public was amazing. People offered to help with the event in many capacities – without their help we wouldn’t have been able to pull off the pop up bike lane, which spanned 10 city blocks. My original thought was that we’d set up a bike lane that covered a block, maybe two. Michael suggested we go big, that we would set up a bike lane on 102 ave that went from 108 st to 118 st. I originally didn’t believe we could make it happen. Most pop up bike lanes that I’ve read about only span a few blocks. But we managed to pull it off. And that’s Edmonton for you – it shows up, helps you carry out your ideas, and exceeds your wildest expectations. The intention of the pop up bike lane was to get people together and show the City that we are serious about these bike lanes. To communicate that we want them prioritized in the Capital Budget. We have a small window to act. The Capital Budget will be approved in December 2014 and we need city council to budget for the 102 ave bike lane. It was announced by the City on September 19th that 102 ave was the preferred route – now we just need to pay for it. In the next 5 years, downtown Edmonton will be transformed by new developments of all kinds. The downtown core will attract more people, and bike lanes (in concert with public transit) will need to be part of the strategy in getting those people around our growing city. I know that Edmonton has aspirations in being a “globally competitive city” – I don’t see it being one without viable and smart cycling infrastructure. But bike lanes are more than just segregated pieces of concrete or lines painted on a road. 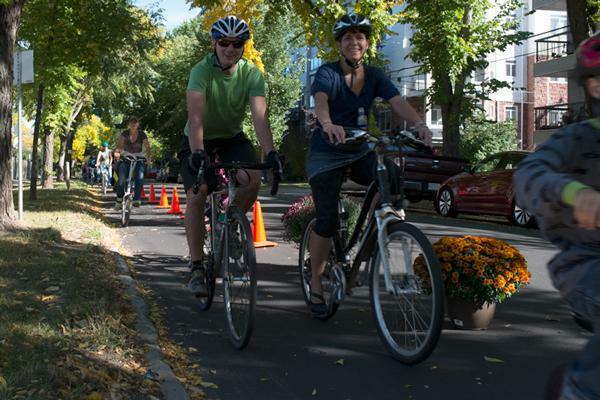 The social, economic and health benefits of bike lanes are numerous. You can read about them here. One aspect of cycling that I’ve come to appreciate is that it is an accessible and affordable method of transportation for Edmontonians living in poverty. Based on Alberta’s minimum wage of $10.20/hour, annual income would be $21,216 (before taxes). The other day I read an article that stated the average annual cost of owning and operating a compact vehicle is approximately $9500/year . Factor in the average cost of groceries at $5400 a year . And then there’s rent. Based on these stats from October 2013, the annual cost to rent a two bedroom apartment in Edmonton is $13, 692. At this point if you do the math, you’ll see that the average person living on minimum wage is barely able to afford their basic needs, let alone own a car. Owning a car could take up to half of their annual income. And this is assuming they are employed. There are many more people living in much more dire situations. Current stats indicate that 100,810 Edmontonians live in poverty – that’s roughly 12% of our city living in circumstances where it may not be feasible to own and maintain a car. It is evident that we need more affordable options for transportation. Mayor Don Iveson has done some amazing work working to obtain the funding needed to expand our LRT system. But it doesn’t end there. Public transit is just one facet of active transportation. We need safe and accessible bike routes throughout our city. Amongst other benefits, establishing bike lanes will demonstrate that we recognize the needs of those who can’t afford cars. For far too long, the system has catered to a certain subset of our population, often those who are the most privileged. We need to shift that type of thinking, and establishing smart and safe bike infrastructure is part of that shift. Bike lanes are crucial to Edmonton being an inclusive and healthy city. Last night I had my first meeting with the Community Well Being Working Group, which is working to support the mandate of the Mayor’s Task Force to Eliminate Poverty in Edmonton. I am honored to be involved in helping co-chair that working group, and proud to live in a city where our Mayor has prioritized poverty elimination as one of the foremost areas of action. When I reflect on how community well being is tied to poverty elimination, I see the establishment of safe cycling infrastructure to be an undeniable part of the solution. I don’t see bike lanes as the sole means of eradicating poverty, but a supportive element that would contribute to that mission. Cycling promotes health, is affordable, and contributes positively to community. I’ve blathered on a bit, as this topic is one that I am passionate about. This post was my longwinded way of saying that I encourage urge you to write your city councilors in support of establishing the 102 ave bike lanes in the 2015 Capital Budget . Previous Post What is community?